New GZG Robots. 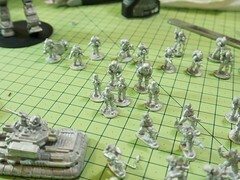 Bouncer types and smaller female droids in 15mm. Robin, is there any possibility of getting a close up.... my eyes aren't what they used to be !! Did you try flickr: http://www.flickr.com/photos/inrepose/6379480469/ I will have another go tonight. Ah hah, I've just twigged onto the magnification feature that comes up once you've clicked on a picture. Yes sorry - should have pointed out that Flickr has a way of hiding its tools away into miniature icons which are difficult to spot.